Page speed is a term which is increasingly being used across the web and this down, in part, to search engines, such as Google, who take into account page speed analyses in their page ranking algorithms. Additionally, however, research shows that website users expect pages to load quickly. 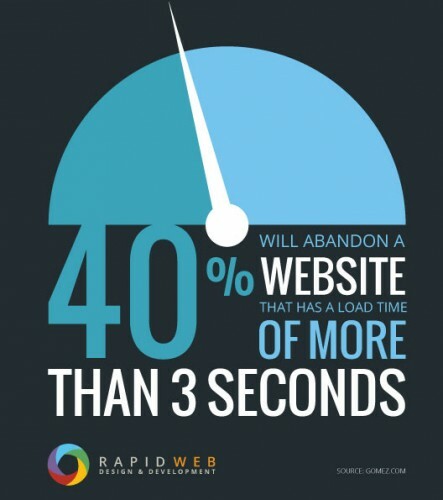 In fact, 40% of users will abandon a slow page after 3 seconds. For those who are not familiar with the term, Page Speed refers to the speed at which your website loads, taking into account whether it’s a first visit or a repeat visit. There are many different factors which can affect the speed of your website such as the size of the resources (i.e. images and videos), where they are being loaded in from, file format of the images and whether items on your website utilise a cache (a temporary store of a previously accessed result). If you are only intending the image to be used as a thumbnail then there is little point using a 1000 pixel x 1000 pixel image as this does not suit the purpose of the image and means you are loading an unnecessarily large image. The quality of image also impacts on the file size of the image and in most cases images are higher quality than what is required – it is possible to reduce the quality of the image from 100% to 75% without a noticeable impact on quality whilst achieving a massive saving in file size. If you are using JPEG format images on your website which are of the correct dimensions and you have reduced the quality to achieve a saving in file size there is a further optimisation technique which can be utilised to further improve load times. Progressive JPEGs are a format which is starting to be used widely for the web and this is primarily for the reason that with Progressive JPEGs you can view a low quality preview of the image before the image has fully loaded, which means that the rest of the page will not be waiting for that image to be fully loaded. There are different types of caching which can be added to your website to help loading times and these will help page speed on first load and any subsequent page loads. For database driven websites (such as product catalogue websites, blogs and e-commerce websites), it is possible to capture and create a temporary store of the results which negates the need to actively query the database on every request, which in turns improves page load times. It is also possible to utilise a browser to cache the static elements of your website such as images and styling. By telling the browser that these elements are cacheable, it means that on subsequent page loads the browser will grab these resources from its own local store instead of requesting the resource from the web server. By using these and other techniques it is possible to substantially decrease the page load times and improve the website experience for any potential customers and visitors to the website, with the added advantage that this might potentially have a positive impact on your Google rankings.